Foraging in my fridge yielded more ingredients. I got some fresh zucchini and lime. Mixed rice was foremost in my mind. When I want to redress leftovers to disguise them from the kids who don't eat repeats, I usually toss them together in rice or pasta dishes. They never suspect that they are eating the dinner from the previous night. While I was tossing together the rice in the saucepan, I forgot all about the zucchini. It was too late to add them but then, a sudden thought started brewing in my mind. 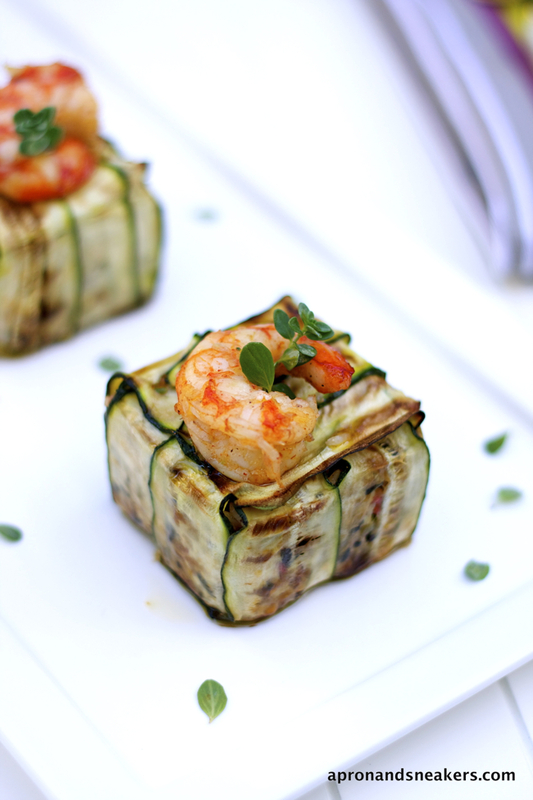 Thinking of my Baked Anelletti in Aubergine Crust, I thought of making a timballo with rice and wrapped with zucchini this time. And in the form of a cube. I just saw a recipe of mashed zucchini in this shape in the cookbook my husband gave me. 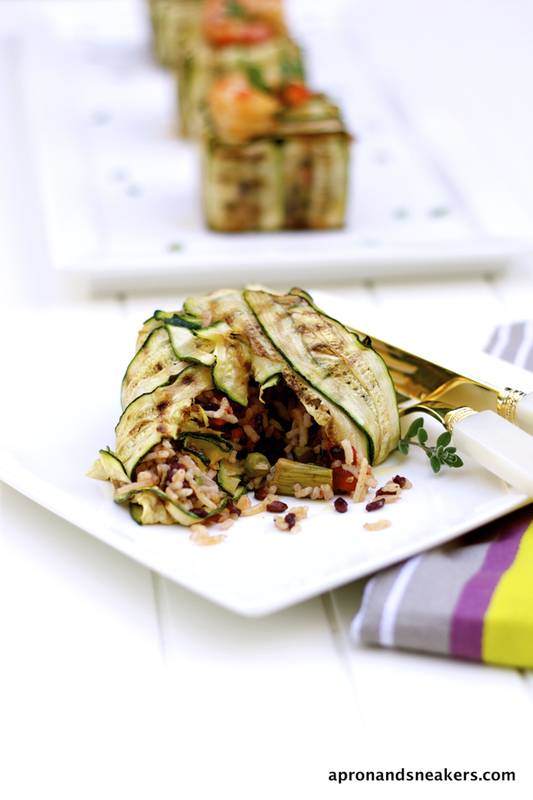 Mashed zucchini doesn't attract me but mixed rice as filling can be a good idea. When I took out the mini timballi, I immediately loved how they looked like. And I was relieved that all of them retained their shapes after I took them out of their square molds. Truth be told, I stared at them for a few minutes before I jolted back to reality. You know the feeling when you work on something with big expectations and you are relieved that it came out like how you pictured them in your mind? I had a a joyous release of relief. Does that make sense? I already feel like this after making these mini timballi. I wonder what I would do if I am able to produce one of those cake masterpieces? Sigh. That's another life. I started this recipe thinking of just a regular plate of mixed rice that I was not going to blog about so I didn't think about measuring anything. 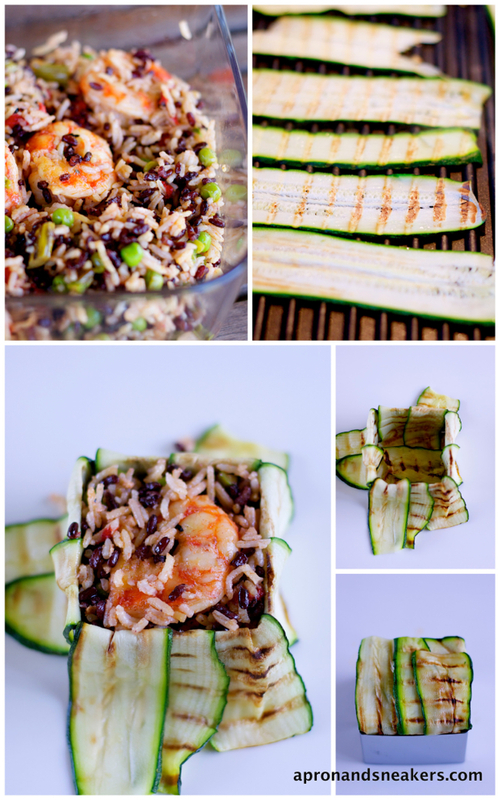 After tasting the rice and wrapping them up in grilled zucchini, I thought that it's a good recipe to share. Slight changes on the amount of the ingredients shouldn't alter the taste so I hope I gauged the right measurements and I hope you enjoy this recipe. But before I leave you, I would like to introduce you another beautiful small medieval hilltop town in Emiglia-Romagna, Italy called San Leo (Saint Leo). 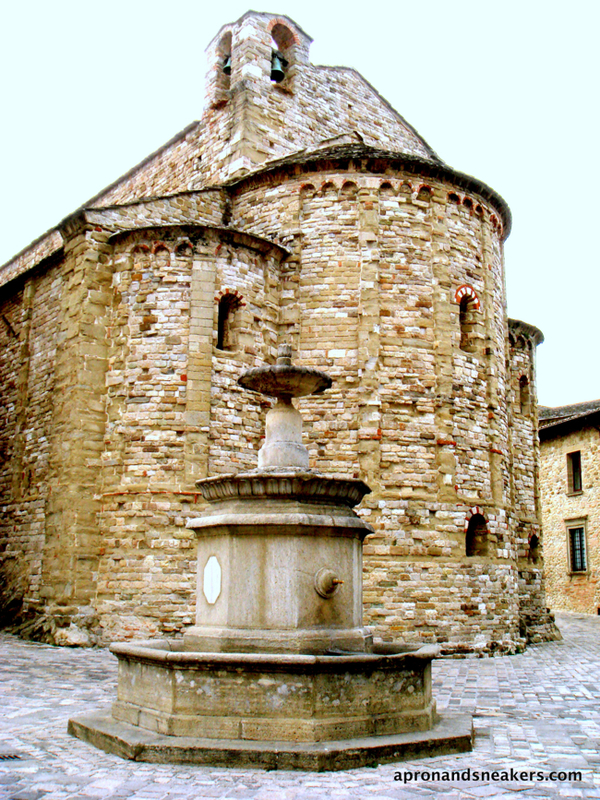 San Leo, along with 6 other towns of Marche were passed to its neighboring region, Emilia-Romagna last August 2009. No wonder, I got confused there for a while. When we went there and to some other towns around it, they were still under the region of Marche. 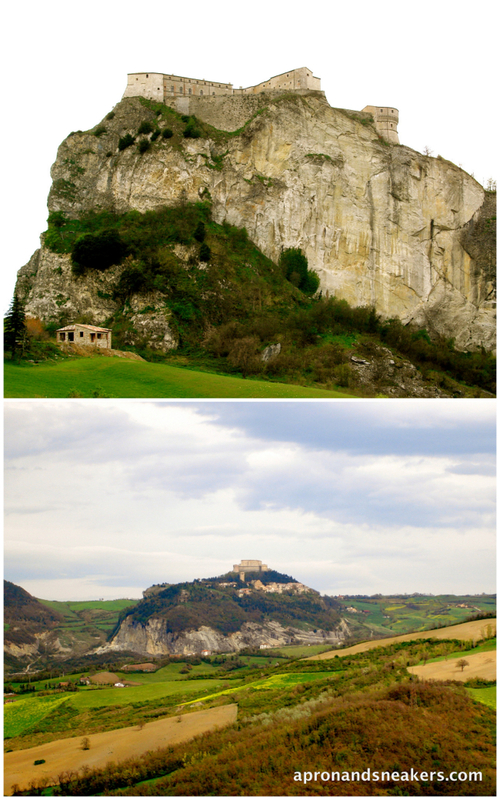 It has an interesting history that is attached to its neighboring hilltop state, the Republic of San Marino. San Leo and San Marino (Saint Marinus) were residents and life-long friends from Rab (present day Croatia). They went to the city of Rimini (Italy) as stonemasons. Both friends fled to Monte Titano during the Diocletianic Persecution following their Christian sermons. San Marino built a small church and thus founded what is now the Republic of San Marino, officially on the 3rd of September 301. 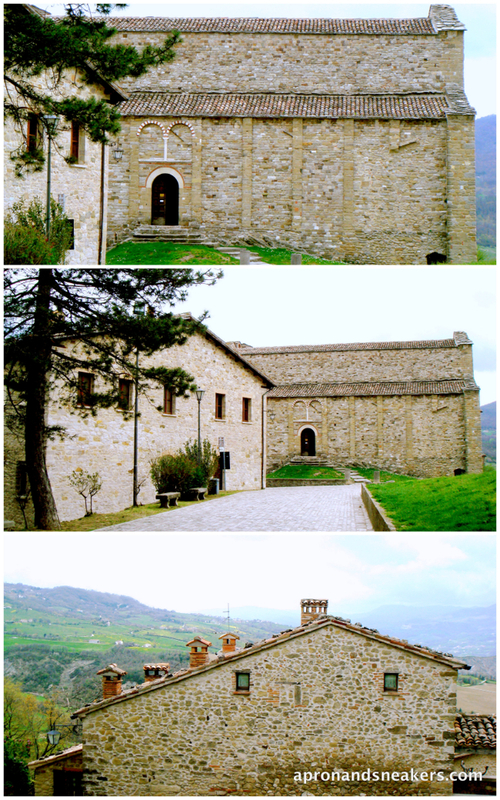 San Leo, on the other hand, left Monte Titano and moved to Monte Feltro where he also built a church and the place eventually became the town of San Leo. 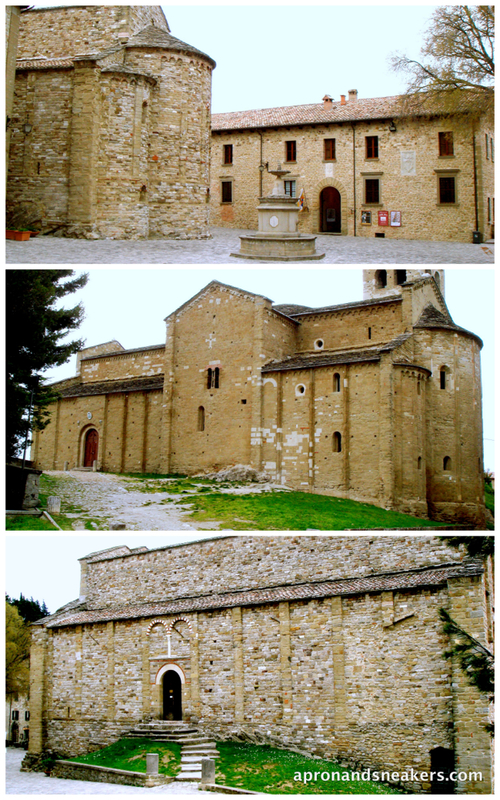 Aside from the massive castle overlooking the town of San Leo, there are two Romanesque churches, the parish church and the cathedral, next to each other in the town. They are believed to be erected on the same period, between the 8th to the 10th century. 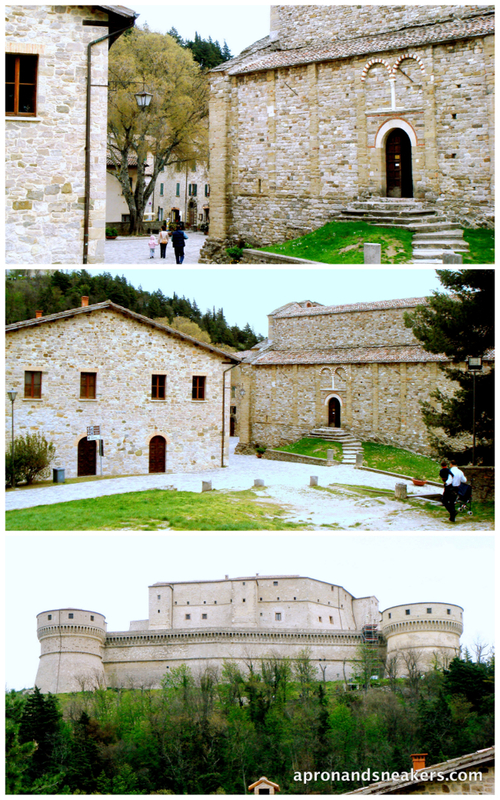 You can lean more about it at the site of I Borghi Piu' Belli d'Italia (The Most Beautiful Villages of Italy). I hope you enjoyed both the recipe and the pictures of San Leo. I would be posting the pictures of the Republic of San Marino next. 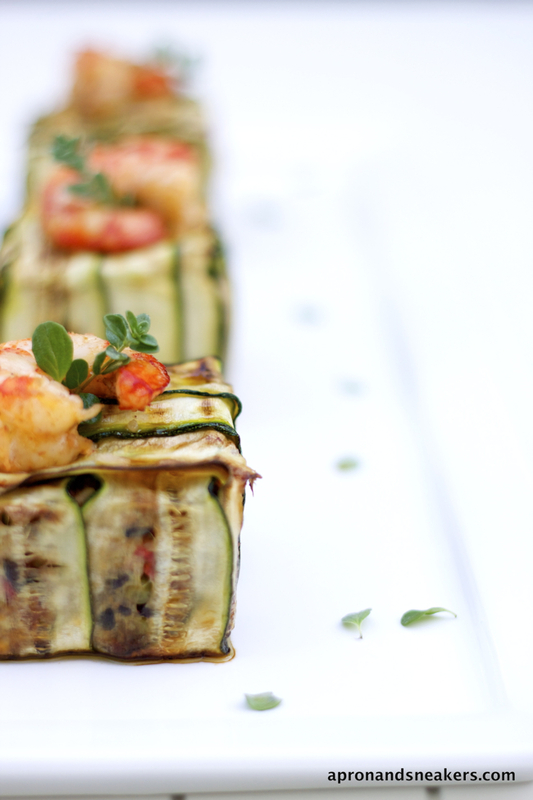 Slice the zucchini lengthwise with a mandoline or with a sharp knife. Try not to damage them because you will be needing long slices to cover the timballi. 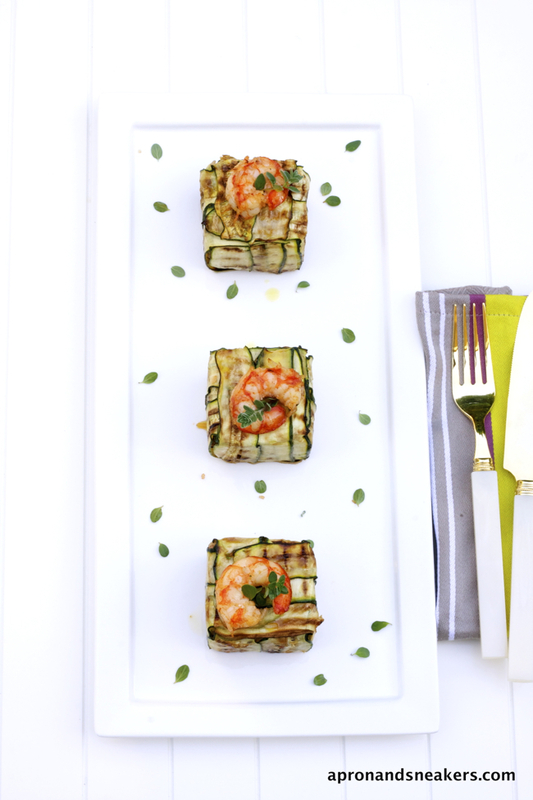 Grill both sides of the zucchini slices on a hot griddle. Set aside. In the meantime, prepare the rice filling. Warm up some extra virgin olive oil in a large saucepan. Add garlic and when it changes color, add shrimps. Season with paprika, salt & pepper. After about 5 minutes, add the peppers, asparagus and peas. Toss together for 5 minutes. Add both kinds of cooked rice and mix well. Add thyme, lime zest and juice. Season with salt & pepper (and more lime) if needed. Drizzle with more extra virgin olive oil if you see that it is dry. I always drizzle anyway. Prepare the baking tray and the square (or round) mold that you are using to make the timballi. Rub some oil on the tray and the inner part of the square mold. Put the square mold in the middle of a plate or straight on the baking tray itself. Put a slice of zucchini on the mold with one end in the middle of the mold (touching the plate) and the other end hanging outside the mold. Please refer to the photo on top. 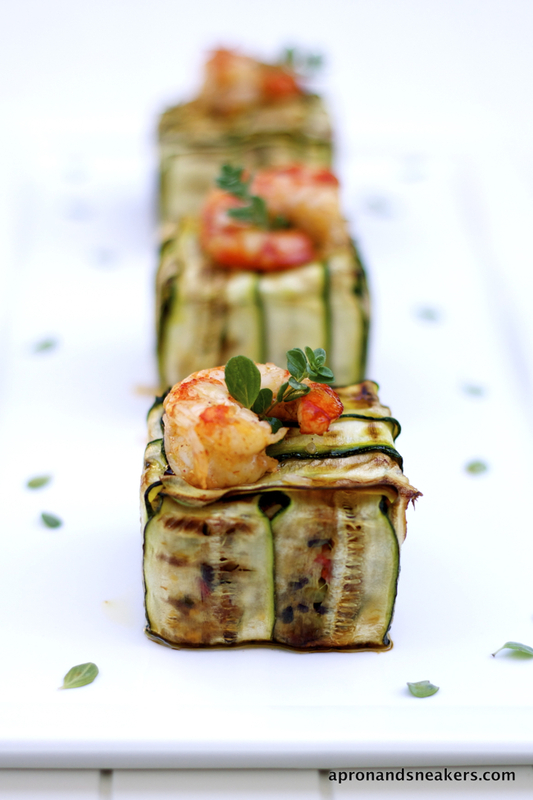 Continue putting the zucchini slices until you cover the whole mold. Put a small slice in the middle of the mold (on the plate) to secure the bottom part of the timballo. Fill up with the rice mixture. Close with the zucchini slices hanging outside the mold. Top with a shrimp. If you prepared it on a plate, transfer it on the baking tray with the help of a metal spatula. Drizzle with extra virgin olive oil and sprinkle with salt & pepper when all the timballi are on the baking tray. Bake at a preheated oven at 180 degrees Celsius for 20 minutes. Let them cool for about 5 - 10 minutes. Slowly pull out the square mold.